Features: Chronograph. Crystal: Sapphire Glass. It’s a quite rare model featuring genuine diamonds (total weight 2.25 carat). This is a very elegant piece of luxury. Diamond Color: H-J. Diamond Clarity: SI. Dial Color: Black With Mother of Pearl Subdial. Let us WOW you. Material Band: Stainless Steel. Watch Information Features: 0.24ct Diamond. Case Size: 45mm. Model: W333. Dial Color: Black With Mother of Pearl Subdial. Material Band: Stainless Steel. Watch Information Features: 0.24ct Diamond. 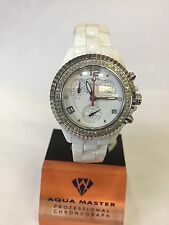 Ladies Aqua Master WHITE CERAMIC Stainless Steel Genuine (1.25ct) Diamond Watch W#115S. OTHER DETAILS: The item includes aqua master warranty card and original leather display box. CRYSTAL: Scratch-Resistant Sapphire. 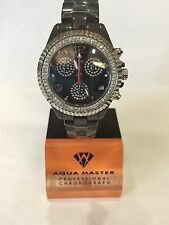 Ladies Aqua Master BLACK CERAMIC Stainless Steel Genuine (1.25ct) Diamond Watch W#115S. OTHER DETAILS: The item includes aqua master warranty card and original leather display box. CRYSTAL: Scratch-Resistant Sapphire. Ladies Necklaces. Browse All Ladies Chains. Ladies Pendants. Quality Diamond Jewelry For Less. Diamond Chains. Three-Piece Trio Sets. Custom Diamond Pendants. Heart Shape Pendants. Ladies Necklaces. Browse All Ladies Chains. Colored Diamond Pendants. Ladies Pendants. Browse All Colored Diamond Pendants. Quality Diamond Jewelry For Less. Diamond Chains. Three-Piece Trio Sets. 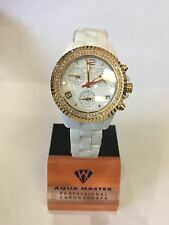 Aqua Master White Ceramic 3.00 Ct Diamond Watch. - Silver Diamond Bezel with White Diamonds. - Matching Ceramic Bracelet (15 mm width) with 1.75 ct Diamond Links. - Sapphire Crystal. - White Ceramic Case (approx. ). About Product. It will be notified to you when you request for a RMA. Item Code: WA597AD91552138-us. Type: Watches. Australia, Belgium, Brazil, Canada, Croatia, Denmark, Estonia, Finland, France, Germany, Gibraltar, Great Britain, Hong Kong, Hungary, Ireland, Israel, Italy, Japan, Latvia, Lithuania, Luxembourg, Malaysia, Malta, Netherlands, New Zealand, Portugal, Singapore, South Korea, Spain, Sweden, Switzerland. About Product. It will be notified to you when you request for a RMA. Type: Watches. Australia, Belgium, Brazil, Canada, Croatia, Denmark, Estonia, Finland, France, Germany, Gibraltar, Great Britain, Hong Kong, Hungary, Ireland, Israel, Italy, Japan, Latvia, Lithuania, Luxembourg, Malaysia, Malta, Netherlands, New Zealand, Portugal, Singapore, South Korea, Spain, Sweden, Switzerland. Of genuine diamonds on the bezel. About Product. It will be notified to you when you request for a RMA. If we have made a mistake we will always rectify it. Type: Watches. Australia, Belgium, Brazil, Canada, Croatia, Denmark, Estonia, Finland, France, Germany, Gibraltar, Great Britain, Hong Kong, Hungary, Ireland, Israel, Italy, Japan, Latvia, Lithuania, Luxembourg, Malaysia, Malta, Netherlands, New Zealand, Portugal, Singapore, South Korea, Spain, Sweden, Switzerland. About Product. It will be notified to you when you request for a RMA. Australia, Belgium, Brazil, Canada, Croatia, Denmark, Estonia, Finland, France, Germany, Gibraltar, Great Britain, Hong Kong, Hungary, Ireland, Israel, Italy, Japan, Latvia, Lithuania, Luxembourg, Malaysia, Malta, Netherlands, New Zealand, Portugal, Singapore, South Korea, Spain, Sweden, Switzerland. Aqua master ceramic diamond watch with 1.25ctw diamond bezel. 36mm ceramic case. Australia, Belgium, Brazil, Canada, Croatia, Denmark, Estonia, Finland, France, Germany, Gibraltar, Great Britain, Hong Kong, Hungary, Ireland, Israel, Italy, Japan, Latvia, Lithuania, Luxembourg, Malaysia, Malta, Netherlands, New Zealand, Portugal, Singapore, South Korea, Spain, Sweden, Switzerland. 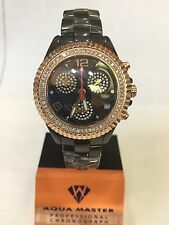 100% authentic stainless steel exclusive model 35mm case size aqua master ladies black ceramic 1.25ct diamond watch. Australia, Belgium, Brazil, Canada, Croatia, Denmark, Estonia, Finland, France, Germany, Gibraltar, Great Britain, Hong Kong, Hungary, Ireland, Israel, Italy, Japan, Latvia, Lithuania, Luxembourg, Malaysia, Malta, Netherlands, New Zealand, Portugal, Singapore, South Korea, Spain, Sweden, Switzerland. About Product. It will be notified to you when you request for a RMA. Item Code: WA597AD91552712-us. Type: Watches. Australia, Belgium, Brazil, Canada, Croatia, Denmark, Estonia, Finland, France, Germany, Gibraltar, Great Britain, Hong Kong, Hungary, Ireland, Israel, Italy, Japan, Latvia, Lithuania, Luxembourg, Malaysia, Malta, Netherlands, New Zealand, Portugal, Singapore, South Korea, Spain, Sweden, Switzerland. Dial Color: White. Let us WOW you. Material Band: Stainless Steel. Watch Information Features: 0.24ct Diamond. Case Size: 45mm. Dial Color: Blue. Material Band: Stainless Steel. Let us WOW you. Features: 0.24ct Diamond. Let us make things right. Dial Color: Black With Mother of Pearl Sub Dial. Let us WOW you. Material Band: Stainless Steel. Watch Information Case Size: 45mm. Features: 0.24ct Diamond.